The day began with 12 players returning to the tournament felt after reaching the money late last night. Online wizard Phil Galfond led the field coming into the day, but the chip lead would change hands dozens of times as the day progressed due to the large limits and swingy nature of the game. One by one, Le's competitors fell as he continued to ascend the chip counts. David Benyamine and Jon Turner were the first two to go, collecting $24,342 for their 12th and 11th place finishes, respectively. Following those two out the door were Michael Chow, Jason Mercier, and Alexandre Luneau, the latter two falling in a spectacular double elimination by Bonomo. This set in motion the unofficial final table of seven. From there, Russian Sergey Rybachenko hit the rail, allowing the official final table to commence. Start-of-day chip leader Galfond began the final table as the short stack. A mere few hands into the final table, he got it all in against Bonomo before the first draw. By the end, Bonomo made an which was enough to send Galfond packing. Galfond collected $51,538 for his sixth-place finish. George Danzer was the next to go, falling by the hands of last year's only 2-7 triple draw event champion Eli Elezra. Danzer could not beat Elezra's ninety-six perfect and he was eliminated from play in fifth place for $70,308. Nick Schulman, whose two WSOP bracelets are in no-limit 2-7 single draw, proved once again why he is considered one of the best draw lowball players in the world, making the final table and ultimately finishing in fourth place. On his final hand, Schulman found himself all in against Bonomo. By the hand's end, Bonomo made a ten-seven low to best Schulman's jack-low. He was eliminated in fourth place and collected $99,015 in winnings. Soon after, 2-7 Triple Draw bracelet winner Elezra was the next to fall. Elezra began three-handed play as the short stack and could not managed to get any traction from there. During his last hand, he found himself drawing thin against Le, who had already tabled an eight-perfect. Elezra rolled over but could not connect on the final card. Ultimately, he paired his three and was eliminated in third place for $144,056. The heads up battle between Le and Bonomo began with the former having a very slight chip advantage. Le came out firing and took the chip lead right away, but the match continued on for several hours. Bonomo managed to work his stack back up to even, but Le continued to hammer away and quickly regained the lead. Eventually, with blinds at 25,000/50,000, Le was able to string together a series of small pots that resulted in the decimation of Bonomo's stack. Soon after, Le opened his button to 100,000 and Bonomo tossed out a call. Both players drew two cards and Bonomo led out. Le called and on the second draw they each pulled one. Bonomo led once more, Le raised, and Bonomo announced all in for 210,000 total. Le called and both players stood pat. With absolutely no sweats, Le showed the better hand and was instantly crowned the champion. 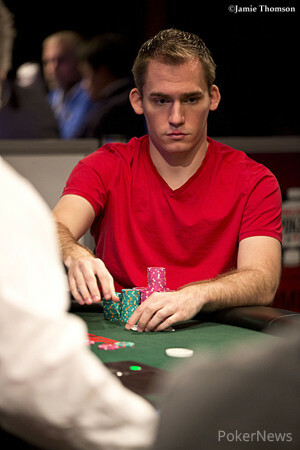 Bonomo was eliminated in second place and collected $219,565 in winnings. That does it for our coverage of Event #5! Be sure to check out our Live Reporting page for all of the latest from every other tournament at the 2014 World Series of Poker! Justin Bonomo Eliminated in 2nd Place ($219,565); Tuan Le Wins! 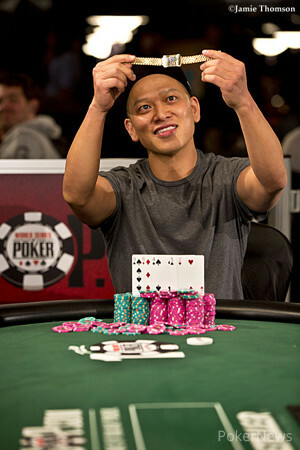 Tuan Le opened his button to 100,000 and Justin Bonomo made the call as both players drew two cards. Bonomo then led for 50,000 with Le calling as both players drew one card each. Bonomo pushed out a stack of pink 5,000-denomination chips and Le asked for a count of what remained in Bonomo's stack. Bonomo shifted his hands so Le could see, and with that, Le tossed in a raise to 200,000. Thinking for a few moments, Bonomo committed his 210,000 total and Le called as both players stood pat. "Nine-eight!" announced Bonomo, and with that, Le slammed over his to better Bonomo's . For Bonomo, this is his third WSOP runner-up finish, but for this 2nd place, he will be heading home with $219,565 in prizemoney. Justin Bonomo has lost several small pots in a row. With the limits as high as they are, these losses have been detrimental to his stack. In one hand, Bonomo made a straight on the final draw to lose. 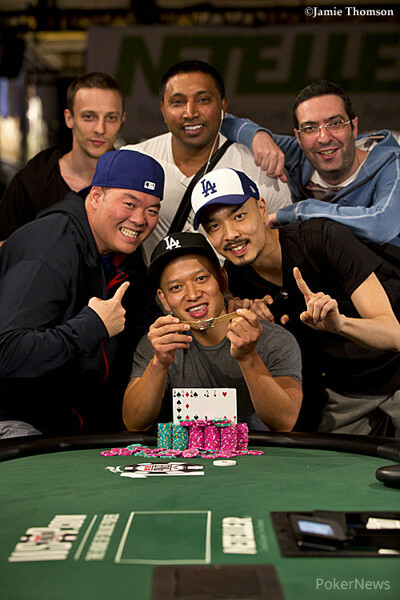 Soon after, Tuan Le made an eighty-seven to scoop another pot. This leaves Bonomo with just 350,000 in chips. Justin Bonomo opened his button and Tuan Le called. Le pulled two new cards on the first draw while Bonomo took three. Le fired out a bet and Bonomo flatted. Le stood pat on the second draw while Bonomo reduced his draw to two. Le fired once more only to have Bonomo come over the top with a raise. Le called. Le opted to break what he had previously made by drawing one. Bonomo, on the other hand, stood pat. Le checked, Bonomo fired, and Le tossed his hand away. Bonomo picked up the pot and now has 1.35 million in chips. Justin Bonomo raised to 100,000 only to have Tuan Le three-bet to 150,000 with Bonomo calling and drawing three to Le's one. Le bet and Bonomo called while drawing two to Le's one again before a bet of 100,000 from Le was enough to produce a fold from Bonomo. Picking up with the action after the first draw, Justin Bonomo led out with a bet and Tuan Le popped it up with a raise. Bonomo called and both players took one card. Action went check-check and they each pulled one again. Bonomo bet out and Le called. Bonomo fanned for a straight and Le did a double take at his hand. Le then rolled over for a winning ten low. Le picked up the pot and now has 3.225 million in chips. The final two players have returned from their dinner break. Card are back in the air!